Soon spring produce will be arriving, and I'll be switching my focus to all those wonderful fresh flavors. I'm starting to see asparagus at the grocery store, but for now, we're still mostly looking at winter vegetables. 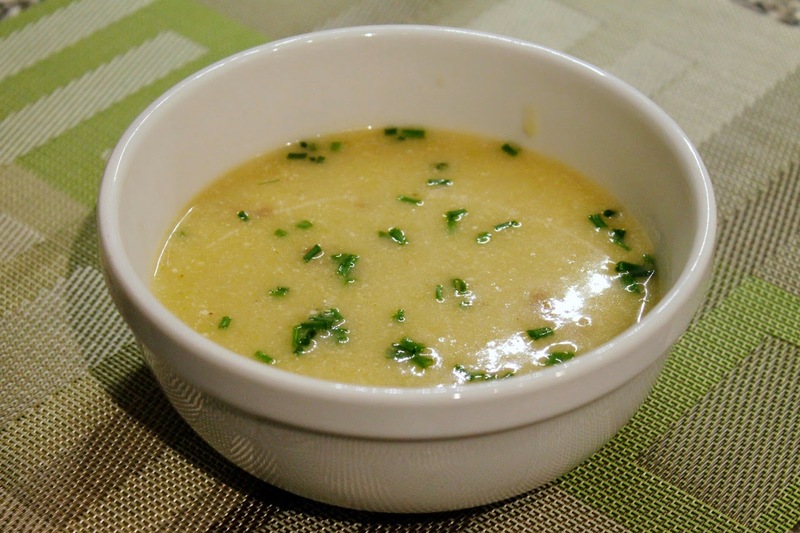 So it's a good time for one last hearty winter soup, and potato-leek soup seems perfect. It feels like a good soup for transitioning into spring: vegetable focused and not as heavy as many other winter soups. Yet, when I made a batch of it recently, I was disappointed. I found it too lacking in flavor. 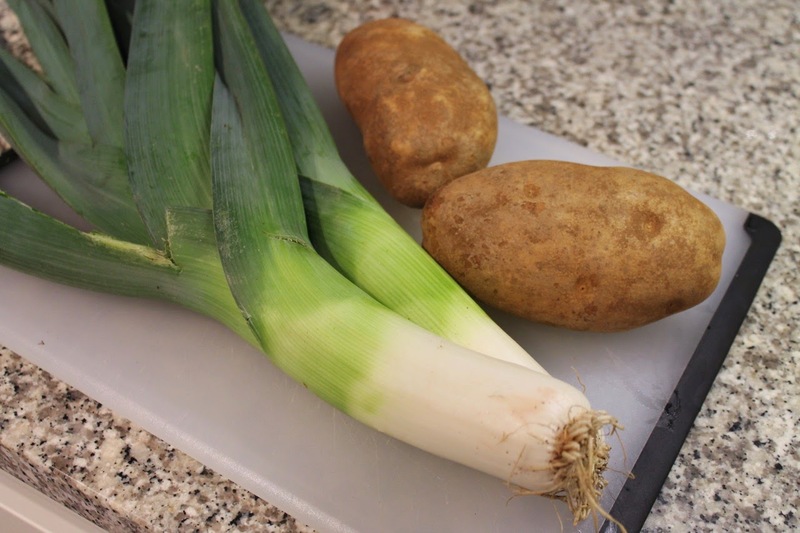 Leeks are like onions but milder and potatoes are...potatoes. They are always mild. A little bay leaf, salt and pepper just wasn't enough to satisfy my craving for bolder flavors. 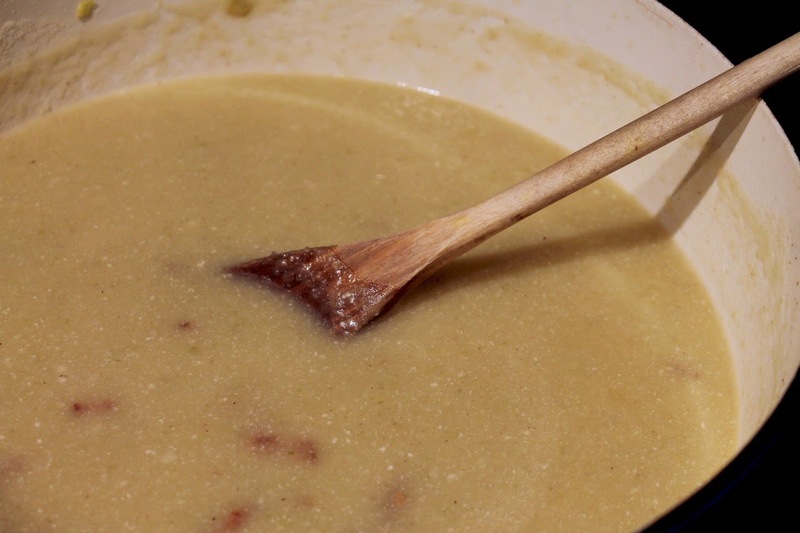 Was it possible to create a potato-leek soup with a little more punch but without overwhelming these two key ingredients. I threw the question out during a recent Washington Post Free Range on Food Chat and got a lot of great responses, such as adding herbs or other spices (a no-brainer), other vegetables (like watercress or mushrooms), curry powder (a great idea I'd like to try sometime) and ham or chicken. The last suggestion got me thinking about using bacon, which goes well with just about anything, but it always a welcome partner for potatoes and onion. I figured it would work nicely in this soup. 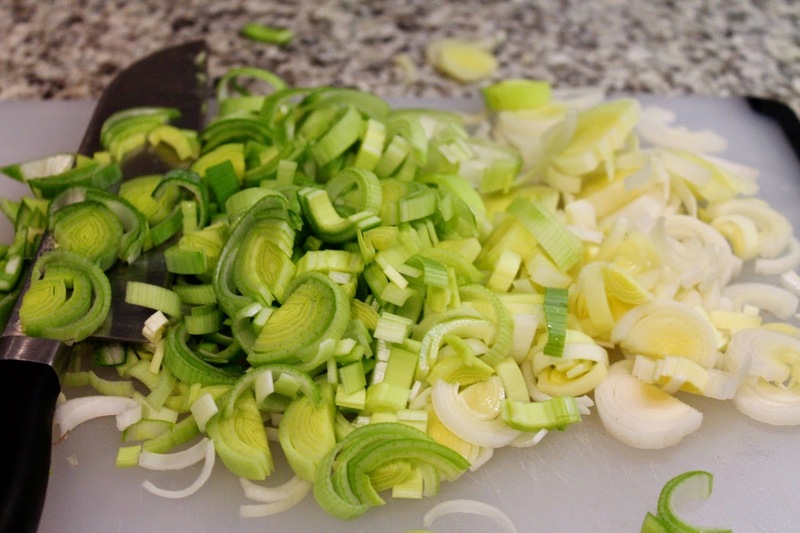 I learned the best way to prep leeks from New York Times writer Melissa Clark. First cut off the dark green part, then slice the leek in half through the root (don't cut the root off yet). Then clean the leeks under running water, separating the layers with your hands as needed. 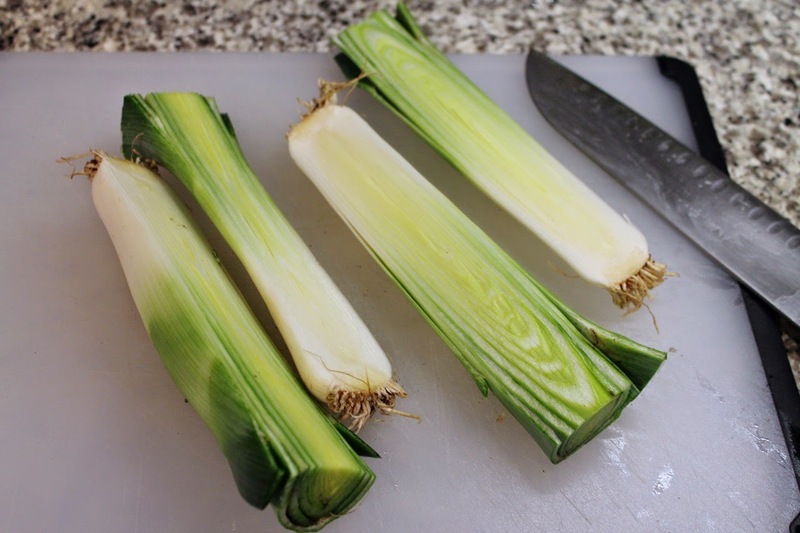 Because the root is still intact, the layers hold together, making the leek easier to clean. Shake off the water, then slice the leeks. For maximum bacon flavor, I used Benton's hickory-smoked bacon, which I've mentioned before is my favorite. I only needed 1/3 of a pound (4 or 5 strips) to add some nice smoky and meaty undertones. Although I pureed the soup for a smooth texture, I kept the bacon out of the soup for that step, as I wanted it in larger pieces. A search for potato-leek soup recipes with bacon led me to a great one by Food Network Kitchen, aspects of which I used as the template for the recipe below. But bacon alone wasn't enough. I wanted some tang, so I was intrigued by J. Kenji López-Alt's Serious Eats recipe, which calls for adding buttermilk in addition to cream. Most buttermilk I see at the grocery store is reduced-fat, but Whole Foods has whole cultured buttermilk. I decided to use a little bit more of that than López-Alt's recipe called for and skip the cream. For spice, I used freshly ground white pepper and just a little bit of chipotle pepper hot sauce, which added some additional smokiness. This soup was exactly what I was looking for. It was still clearly potato-leek soup but with a more complex flavor rounded out with smoke, tang and spice. 1. Cook the bacon in a Dutch oven over medium heat until brown and crisp. Remove with a slotted spoon and set aside on a plate lined with paper towels. Drain off excess bacon fat, leaving about 1 tbsp. in the pot. 2. 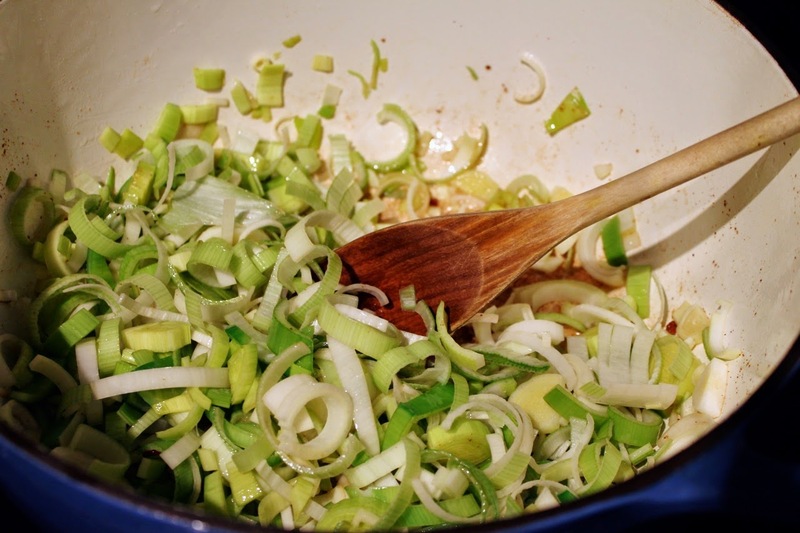 Add butter to pot and, when melted, add the garlic and leeks. Cook over medium heat, stirring occasionally, until softened, about 8 minutes. 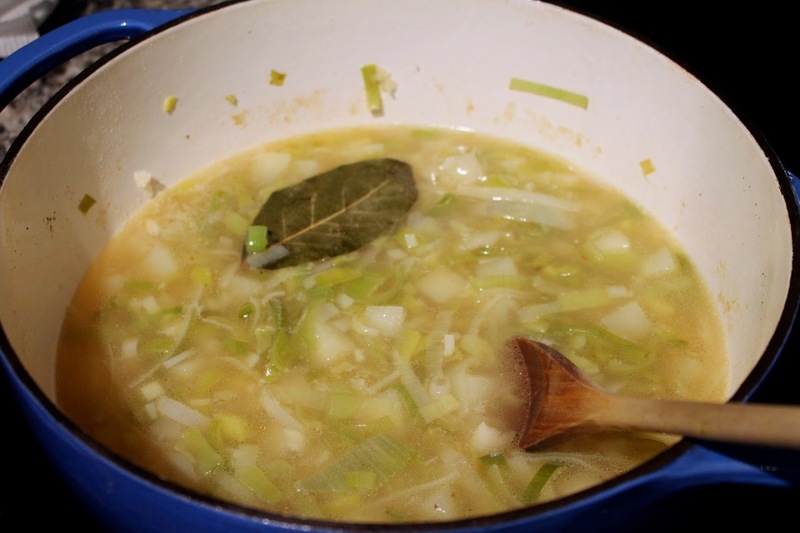 Add the potato, chicken stock, water and bay leaf and season with salt and white pepper. Increase heat to high and bring to a boil. 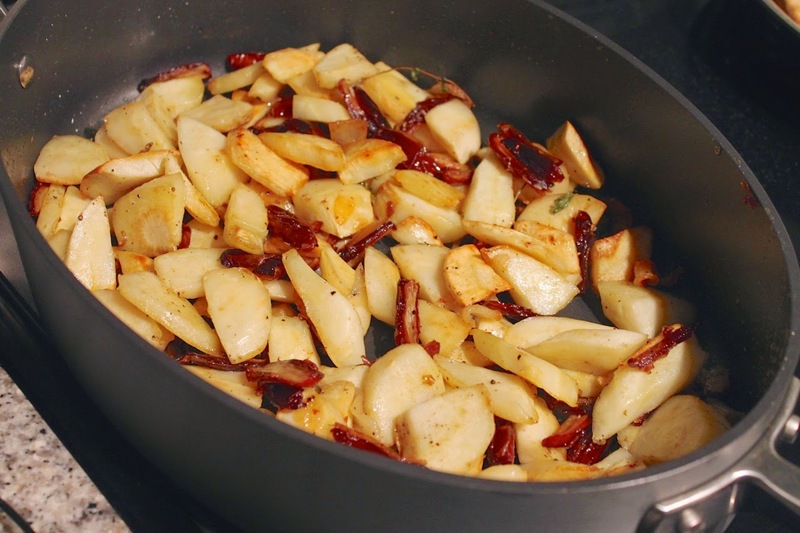 Reduce heat to medium-low and simmer until the potatoes are tender, about 10-12 minutes. 3. Remove the bay leaf. Using an immersion blender, puree the soup until smooth. 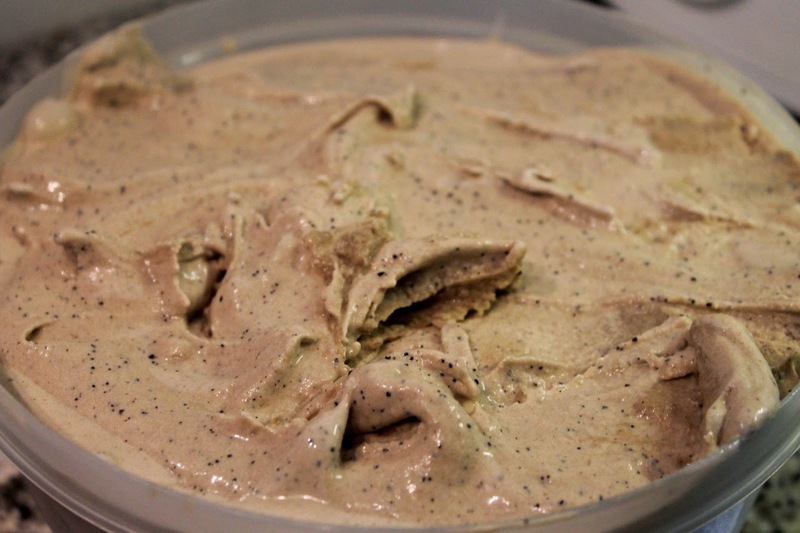 Alternatively, transfer the soup in batches to a blender and puree until smooth. Stir in the cooked bacon, buttermilk, nutmeg and (if desired) the hot sauce. Serve in bowls topped with a generous sprinkle of fresh chives. The late '90s were my college years, 1995 to 1999 to be exact. I wasn't much of a beer drinker in college. I hadn't yet discovered my love of IPA. Even during my semester abroad in London I remember drinking more cider than beer. At the time, I was more into mixed drinks, liked screwdrivers (vodka and orange juice, something I don't drink anymore). During my senior year I started getting into cocktails, and the gimlet was the first one I learned to make. I discovered the recipe for it in Wallpaper, an art and lifestyle magazine I was into at the time. It was very simple: gin, Rose's sweetened lime juice and powdered sugar. I didn't have a cocktail shaker at the time, but I kept the gin and lime juice cold and powdered sugar dissolves in liquid pretty easily. I felt very sophisticated drinking those in my conical martini-style glasses. Today, that recipe doesn't really appeal to me. I'm not a big fan of Rose's sweetened lime juice, although it is traditional for this drink instead of fresh lime juice (see this classic recipe from Imbibe). And I wouldn't use powdered sugar in a cocktail--I'd use simple syrup. Researching the gimlet, I wondered what Jeffrey Morgenthaler would make of this drink. Although he didn't include it in The Bar Book, turns out his take on the gimlet is something he's rather known for. 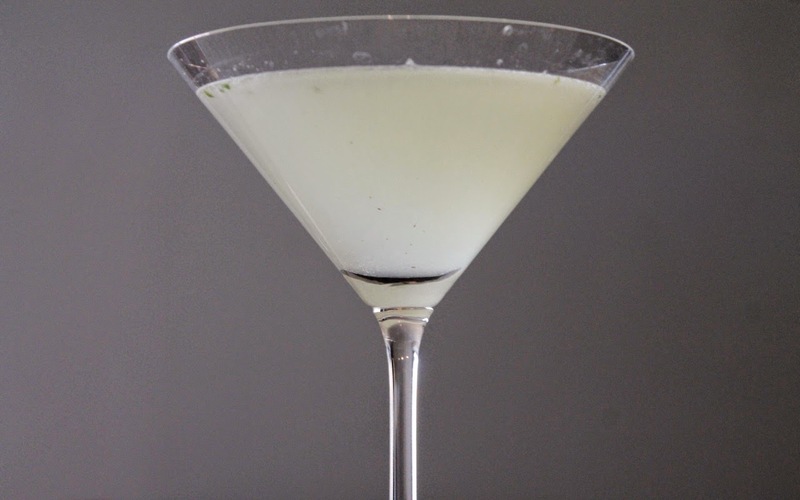 He calls it the Richmond Gimlet, a simple yet inspired pairing of gin, lime, sugar and mint. It's so simple, it's a wonder no one came up with this before. The mint is a welcome addition and I was so glad to see he prefers fresh lime juice to the bottled kind. While I might have some nostalgia for the version I made 16 years ago, I much prefer this improved recipe. Combine gin, lime juice, simple syrup in a cocktail shaker. Add ice and shake until very cold. Strain into a chilled cocktail glass. When I began thinking about what to feature for my week of 1990s foods, I did some research on what others recall as popular foods of the decade. 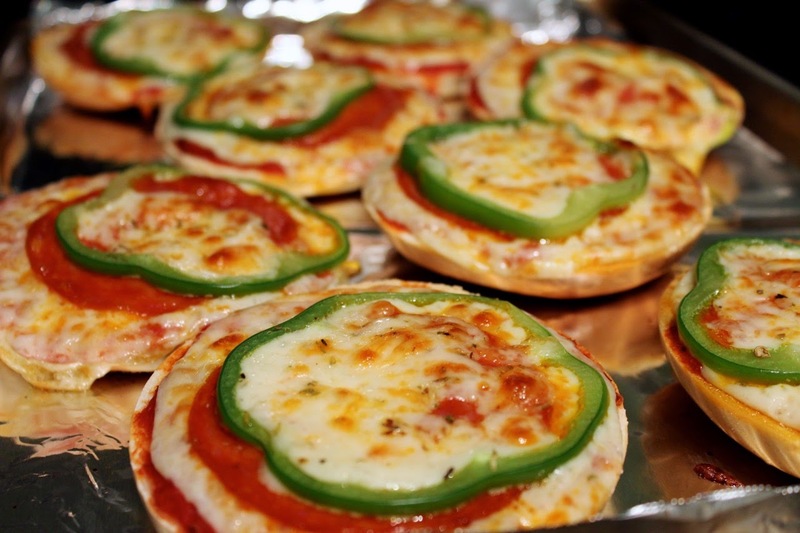 Again and again I saw mentions of bagel pizzas (or pizza bagels, people seem to say it both ways). 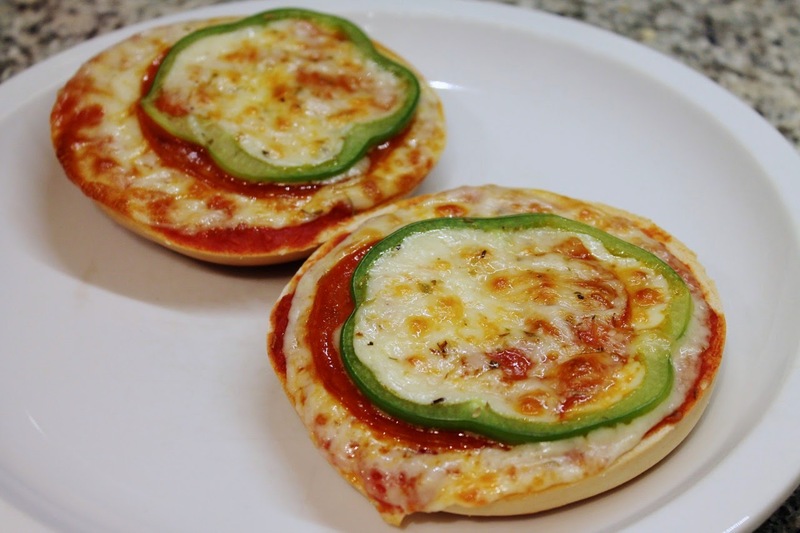 Bagel pizza follow a similar trend from the 1980s: the french-bread pizza. Rather than building a pizza with a foundation of raw dough, you're starting with a pre-made bread product and topping it with whatever you like. It's the kind of time-saver recipe common then (and now), but with enough DIY that it feels more homemade than something popped in the microwave. 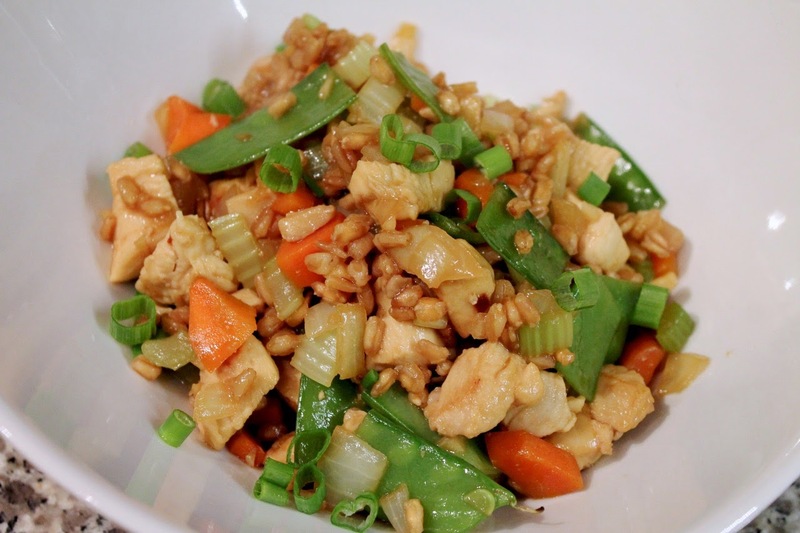 The recipe below is adapted mostly from The Frugal Girl, but I incorporated a few ideas from other sources. One recipe had the great tip of starting the pizza by placing a slice of pepperoni over the bagel's hole to prevent ingredients from falling through. 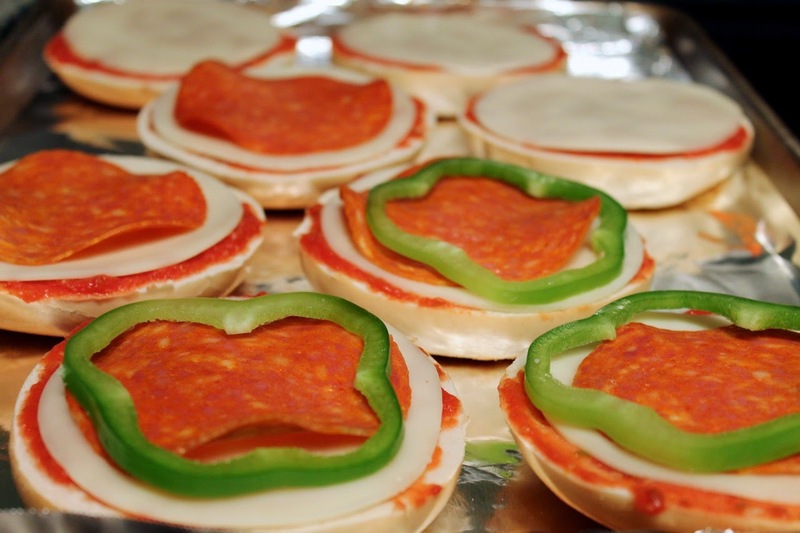 Since I was using very large pepperoni slices, I cut them into quarters for this purpose. I changed the ingredients up, substituting provolone for the mozzarella and adding thin slices of green bell pepper. 1. 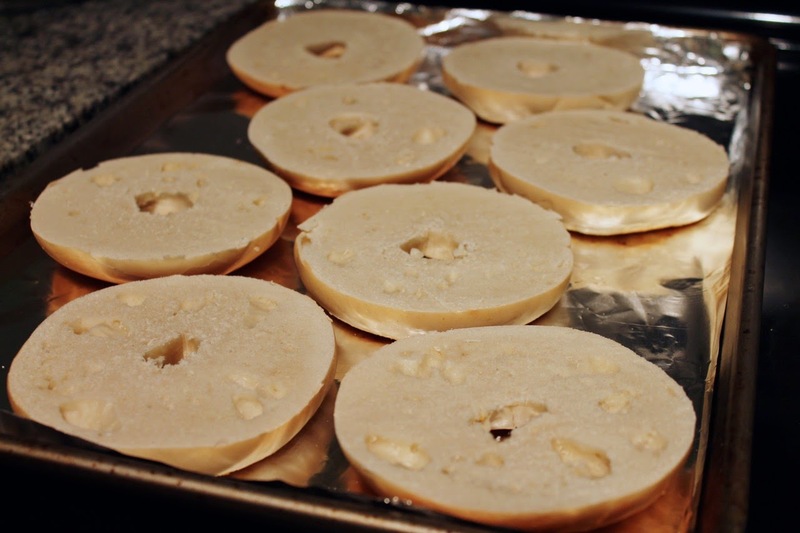 Preheat oven to 350 F. Place bagels evenly spaced on a baking sheet (line the baking sheet with aluminum foil for easy clean-up) cut-side up. 2. If using large pepperoni, cut two of them into quarters and place a quarter over the hole in the center of each bagel. If using small pepperoni, place one over the hole in the center of each bagel. 3. 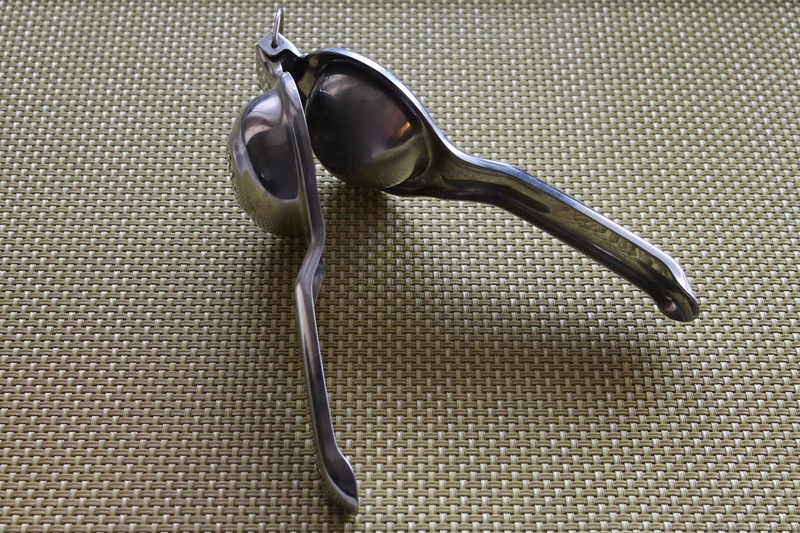 Spoon 1 1/2 to 2 tbsp. pizza sauce evenly over each bagel. 4. If using sliced provolone, place a provolone slice over each sauced bagel. If using shredded provolone, spread an even layer of cheese over each bagel. 5. 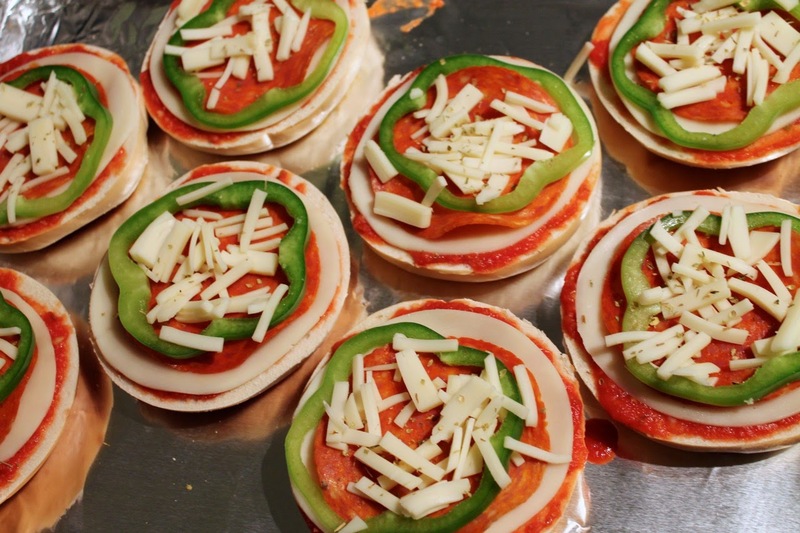 Top the cheese with 1 large or 3 small slices of pepperoni and a slice of green bell pepper. Sprinkle any remaining cheese over the top (if using sliced provolone, chop the cheese into bits first). Sprinkle with dried oregano. 6. Place the baking sheet in the oven and bake until the cheese has melted, about 8 to 10 minutes. Turn on the broiler, and broil until the cheese has browned a bit, about 2 to 3 minutes more. Serve immediately with grated parmesan at the table. Heat olive oil in a medium saucepan over medium heat. Add garlic, chili pepper flakes and oregano and sauté until the garlic is fragrant, about 1 minute. Add the tomatoes, season with salt and cook until the mixture bubbles, then reduce heat and simmer for 15 minutes. It may have snowed in D.C. on Friday, but the weather perked up over the weekend, officially ushering in spring. And that means it's time for a refresh for the menu at Sweetgreen, D.C.'s fast-casual salad chain that has expanded well beyond the D.C. area to locations around New York, Boston, Philadelphia and, coming soon, Los Angeles. In the fall, I wrote about how the chain had changed the approach to its menu, dropping its monthly salad special in favor of a wider selection of rotating seasonal offerings. That approach continues with the new spring menu revealed today with two new salads and a vegan grain bowl. I was eager to try the Salmon and Radish salad, made with roasted salmon, kale, arugula, beets, carrots and a mustard-oregano vinaigrette. The staff at my local Sweetgreen were very excited about this new salad when I visited last week. The salmon is very good--cooked through but not overdone and lightly seasoned. 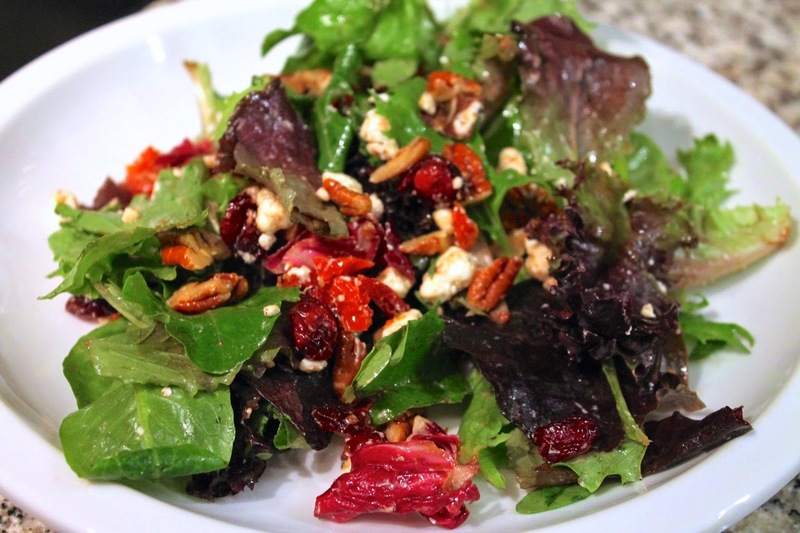 The zesty dressing complements it nicely, and I love the crunch from the radishes and beets. 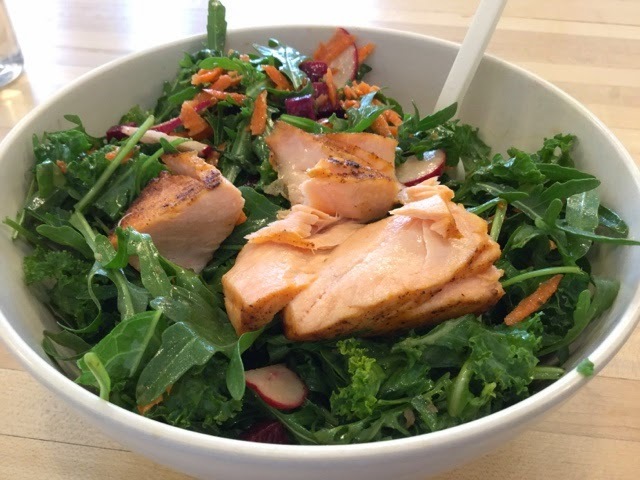 The salmon salad is a particular exciting new offering for Sweetgreen. Although not sourced locally like a lot of its ingredients, Sweetgreen chose Chilean Verlasso salmon as its provider because Verlasso shares Sweetgreen's commitment to sustainability. "While developing our spring menu, we listened to feedback from guests who wanted more lean protein options that were suitable for both lunch and dinner, " says Michael Stebner, Sweetgreen's director of culinary innovation, in a statement released with the new menu. 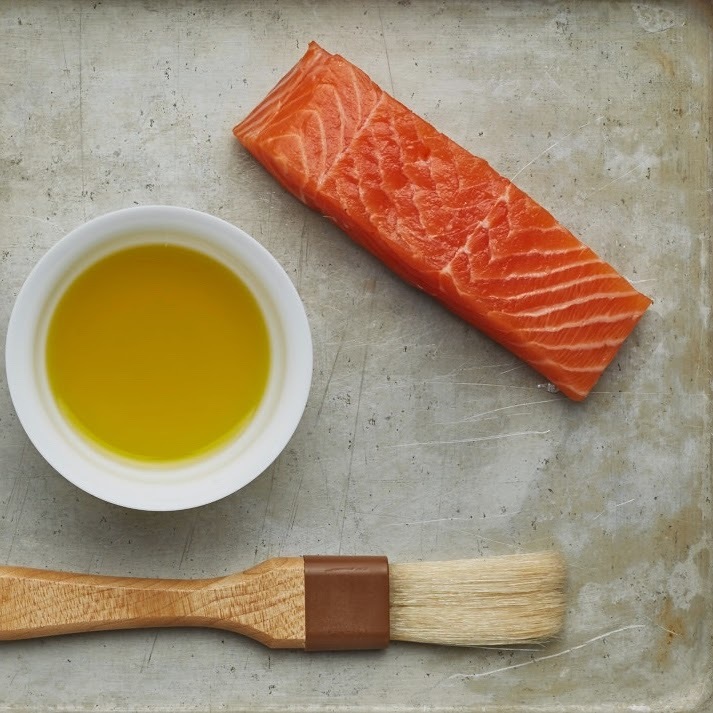 "We set out to find a new protein offering and collectively decided on salmon for its numerous health benefits." Although some salmon farming practices are controversial, Sweetgreen notes that Verlasso's salmon was rated a "good alternative" by the Monterey Bay Aquarium Seafood Watch program. Seafood Watch is an educational effort to help consumers and businesses make seafood buying choices that are better for the environment. Seafood Watch says to "avoid" most types of imported farmed Atlantic salmon, but notes Verlasso as an exception. 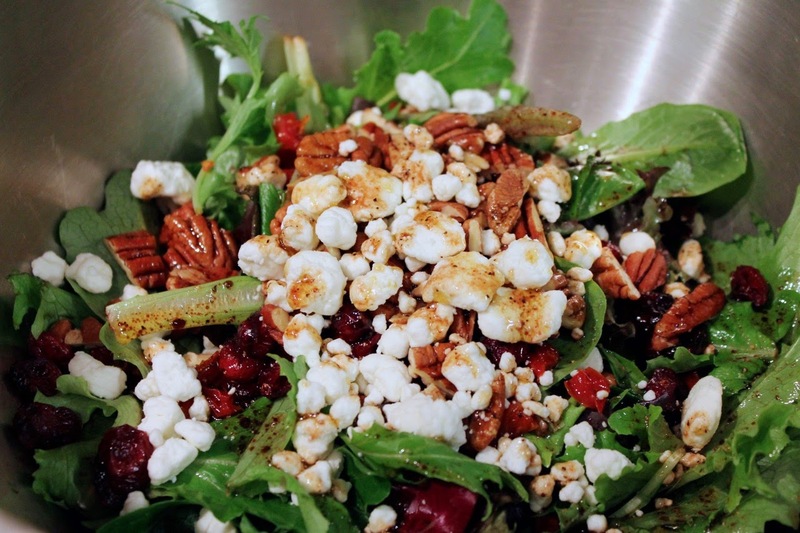 Local Blue Cheese and Bacon Salad. Source: Sweetgreen. 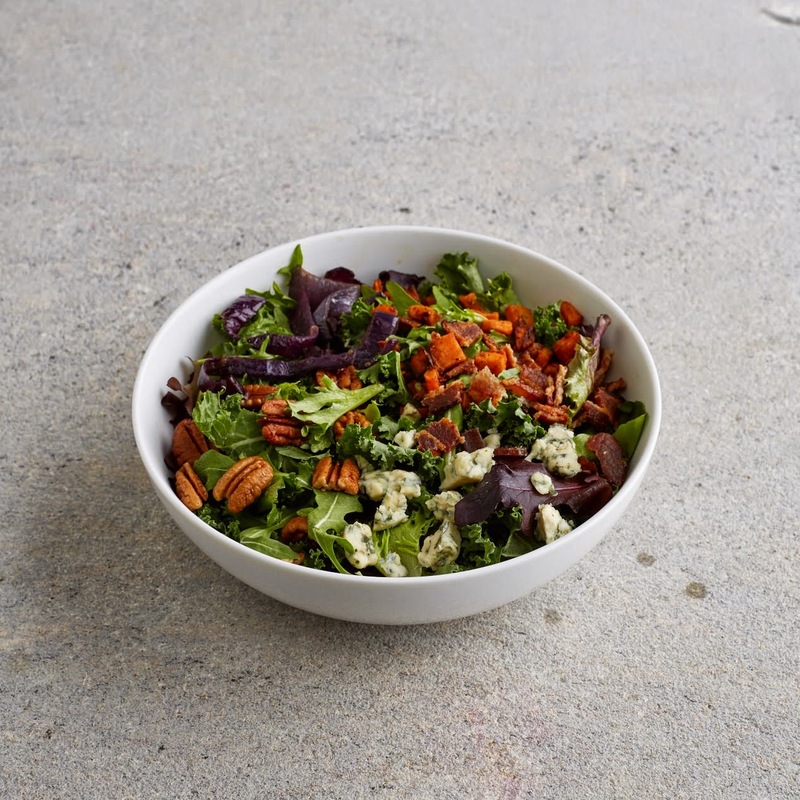 Back on the new menu, I'm also looking forward to trying the Local Blue Cheese and Bacon Salad, made with mesclun, kale, roasted sweet potatoes, caramelized onion, honey-glazed pecans and balsamic vinaigrette. The Umami Grain Bowl--a combination of wild rice, quinoa, farro, swiss chard, roasted mushrooms, onion, roasted tofu, pea shoots, sunflower seeds and miso-sesame-ginger dressing--also sounds quite tempting. I had a small sample of the Umami bowl today and look forward to getting a full bowl soon. Spring is going to be big for Sweetgreen in other ways. In addition to these new menu items, the chain is sponsoring Sweetlife, a 2-day music festival in Columbia, Maryland featuring Kendrick Lamar, Calvin Harris, The Weeknd, Charli XCX and more. Proceeds from the event support Sweetgreen's education program, Sweetgreen in Schools, an effort to promote healthy eating among school-age children. This spring you can eat at Sweetgreen and really feel like you're doing something good for your body, your community and the planet. It's nice to see a fast-food chain with such lofty aspirations that also manages to deliver a delicious product. It's become a place I'm happy to frequent on a weekly basis. When foods become popular, it's rarely because they're new. Think about the things that are food trends right now--kale, quinoa, bacon, Greek-style yogurt, gelato--these are not "new" foods. They've been enjoyed by people around the world for a very long time. But they are food trends, which come about for various reasons, which were fascinatingly explored by David Sax in his book The Tastemakers. I remember Mediterranean foods, and particularly Italian foods, as being a real trend in the '90s. People discovered there were more ways to serve pasta than just spaghetti with meat sauce or & mac & cheese and more interesting ways to make pizza. In general, there was an epiphany that great Italian food can be made with ingredients other than tomatoes and lots of cheese. 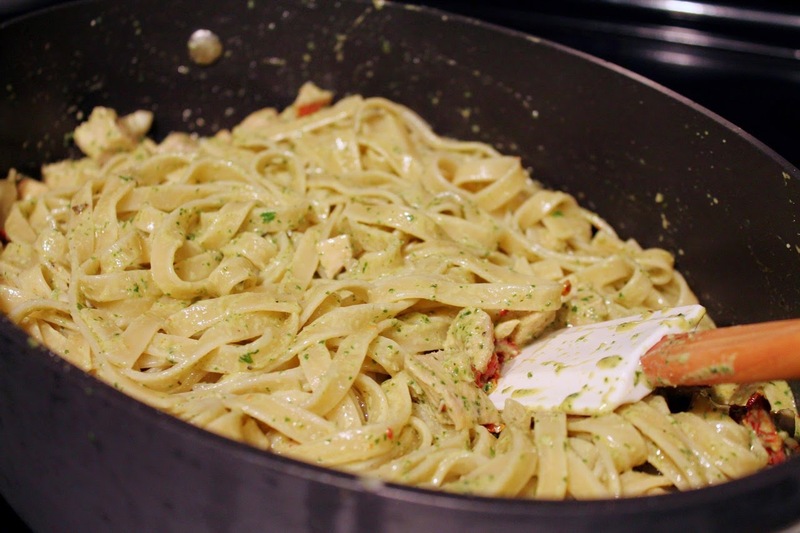 One such ingredient was pesto, the green sauce that is a mixture of olive oil, nuts, garlic, parmesan and herbs--generally basil but sometimes other things. Pesto's roots trace back to ancient Rome, but began to resemble its familiar modern form in the 1600s around Genoa, Italy. Americans began to take notice of pesto in the 1940s with its popularity beginning to really take off in the 1980s until it was "ubiquitous," in the words of Epicurious, in the 1990s. Today it may seem commonplace, but 20 years ago, putting pesto instead of tomato sauce in your pasta or on your pizza seemed like a fresh, exciting thing to try. It heralded a comparatively "lighter" style of Italian cooking, is it was often paired with chicken and other vegetables. 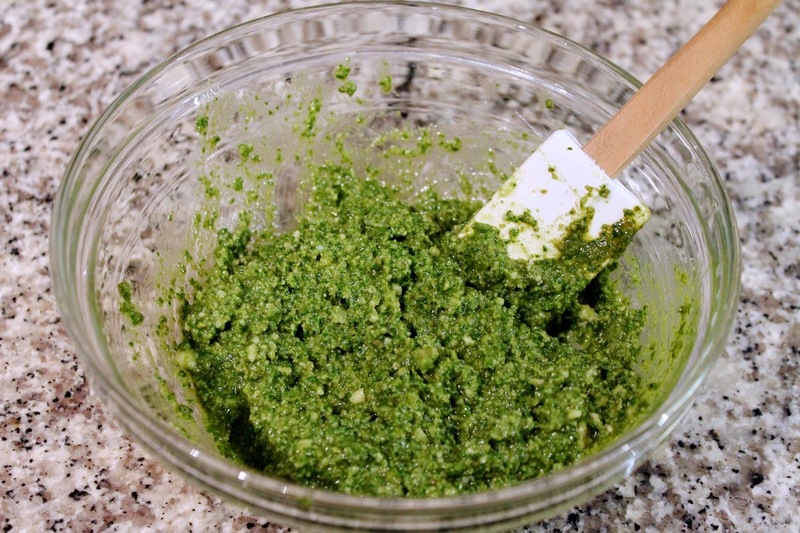 Enthusiasm for pesto may have waned, but it certainly hasn't gone away. And yes, people are even making it with kale these days. 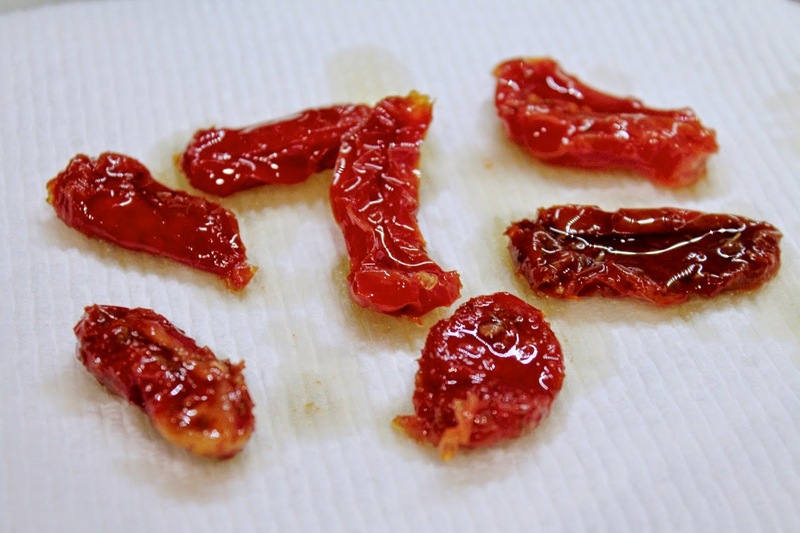 Another food trend from the '90s and one that pairs nicely with pesto was sundried tomatoes. 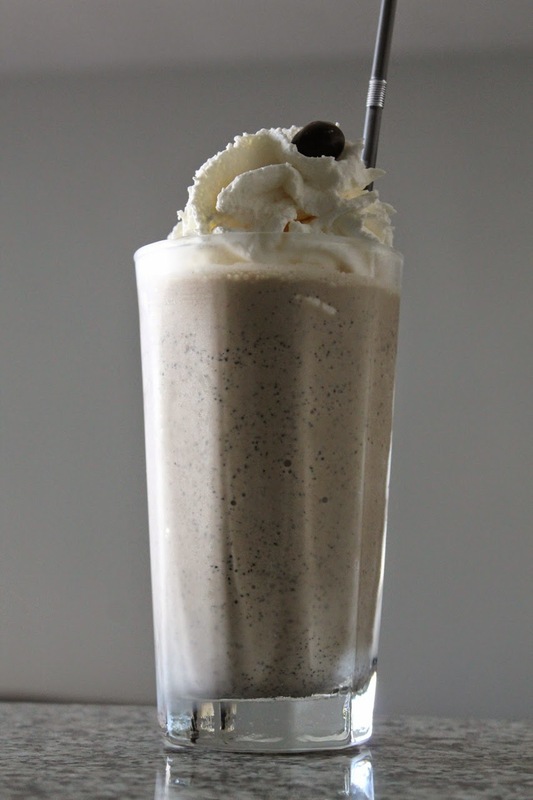 Again, they are something that had been around for awhile, but achieved that special sweet-spot of popularity that made them a hot food trend during that decade. We all got a little carried away with them back then, using them as a pizza topping, a salad ingredient (like I did last week), a mayonnaise filler and a sandwich enhancer. I liked them best in pasta, and still include them from time-to-time. I actually would welcome their comeback, since I love tomatoes, and their concentrated flavor is a great way to add deep tomato flavor during any season. 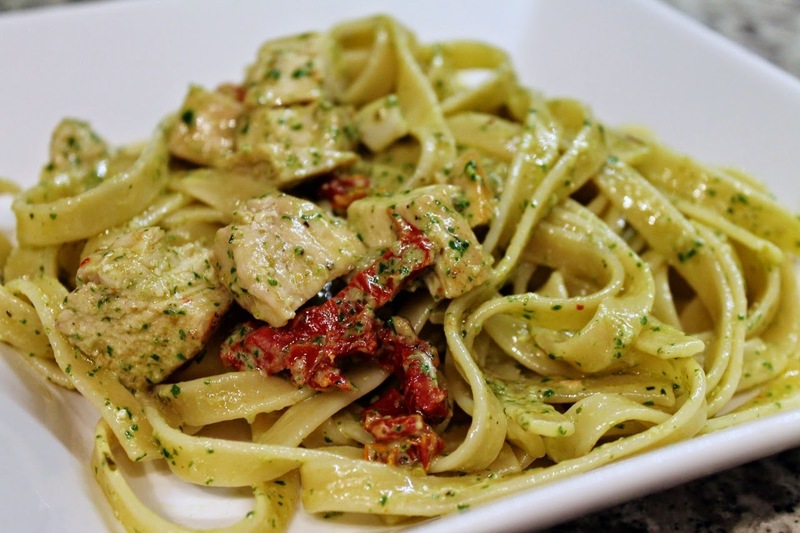 This simple pasta recipe is classic '90s: throw together pesto, chicken, sundried tomatoes, a little cream and fettuccine and you have a dish certain to take you back 20 to 25 years that's still delicious today. 1. Bring a large pot of salted water to boil. Add the pasta and cook according to package directions for al dente. Drain and set aside. 2. Combine the walnuts, 1 smashed garlic clove and basil leaves in a food processor. Pulse a few times to combine and chop up. With the processor running, slowly stream in the 1/3 cup olive oil and blend until the pesto has a consistent texture, scraping down the sides with a spatula if needed. 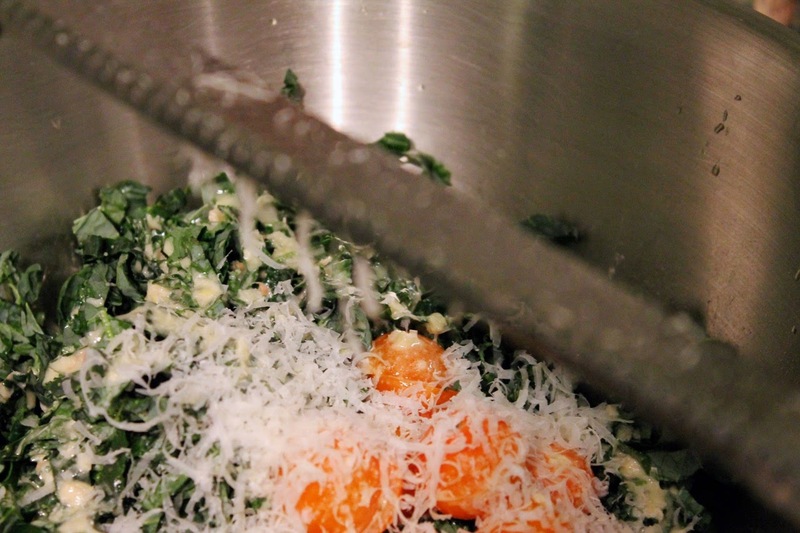 Transfer the blended mixture to a small bowl and stir in the grated parmesan. 3. Heat 2 tbsp. olive oil in a large sauté pan over medium heat. Pat the chicken breast cutlets dry and add them to the pan. Season with salt and pepper and cook for about 10 minutes, turning over after about 5 minutes, until lightly browned and cooked through. Transfer chicken breasts to a cutting board and cut into 1-inch pieces. 4. 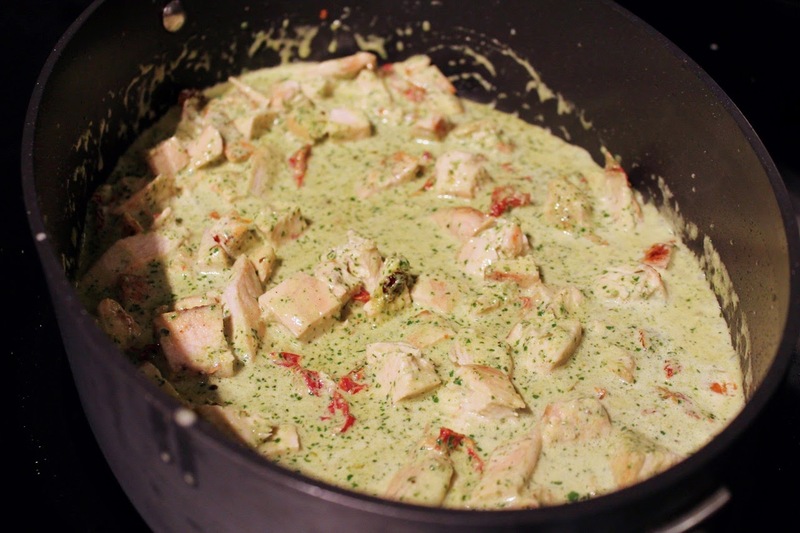 Add the garlic and red chili pepper flakes to the sauté pan and cook for about 1 minute, then stir in the pesto, cooked chicken, sundried tomatoes and heavy cream. Turn off the heat and add the cooked pasta, stirring to coat in the sauce. Serve the pasta in shallow bowls. The mall food court wasn't invented in the '90s--the first successful one opened in a New Jersey mall in the mid '70s--but, at least in Portland, the 90s was when they proliferated. Washington Square, the mall closest to my home, got its first food court during a mid-'90s renovation, but the first mall food court I remember visiting was in Pioneer Place, Portland's downtown shopping mall that opened in 1990. Food courts were the ideal place for a teenager to get a snack. If you were too low on cash to actually buy something, there were plenty of free samples, many of which were little tastes on a toothpick. Pioneer Place's food court was ideal for snacking: it's round shape meant you could do laps picking up samples as you went (of course, I never got more than one sample, I swear). I've mentioned The New Basics Cookbook by Julee Rosso & Sheila Lukins before, but in a week where I'm featuring foods from the '90s it bears mentioning again, as it was published in 1989 and was an important source of inspiration when I was first learning to cook in the '90s. Browsing through it this week, I stumbled upon their recipe for Bourbon Turkey, which struck me as a more refined and certainly better tasting version than what you or I may remember for the mall food court. 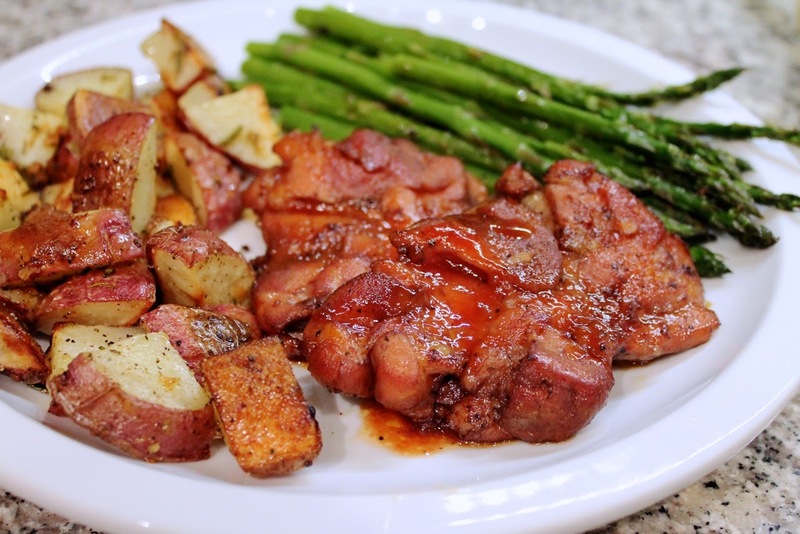 I adapted their recipe for boneless-skinless chicken thighs, which cook in less time than bone-in turkey parts, allowing me to reduce the roasting time. As marinated roast chicken goes, this one is pretty simple. The most complicated part is probably draining off the marinade--which converts to braising liquid--so that the glaze can go on the chicken. I did it using a turkey baster, dumping the braising liquid into a glass measuring cup. I served the chicken with simple rosemary roasted red potatoes (recipe below) and broiled asparagus. It was delicious. Definitely better than what I remember getting from the food court so many years ago. 1. Place the chicken thighs in a large bowl. Stir together the marinade ingredients and pour over the chicken thighs. Toss to coat the chicken in the marinade. Cover and place in the refrigerator to marinate for 1 hour. 2. Preheat oven to 325 F with the oven rack about 9 inches below the oven broiler (you'll be using it later--place the rack in the middle of the oven if your broiler is separate). 3. Stir together the glaze ingredients. 4. 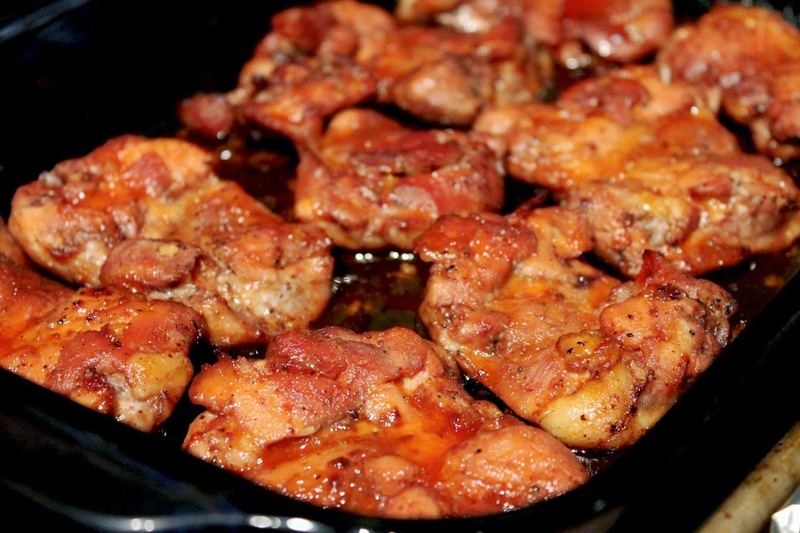 Transfer the chicken thighs to a 9 X 13 baking dish, arranged in a single layer. Pour about half of the marinade around the chicken. Roast for about 40-50 minutes until the chicken is almost cooked through--a thermometer should read about 150 F. Remove roasting pan from the oven and drain off any remaining marinade. 5. Turn on the oven broiler. Brush the chicken with about half of the glaze. Place back in the oven under the broiler and broil for 5 minutes until the glaze has dried out (be careful not to burn it). Turn the chicken over and brush the other side with the remaining glaze. Broil for another 5 minutes. Check the chicken's internal temperature (it should be at least 165 F now). Remove from the oven and serve with any extra glaze from the pan spooned over it. 2. Combine the cut up potatoes, olive oil, garlic, rosemary and salt in a large bowl, tossing with a wooden spoon to evenly coat the potatoes. 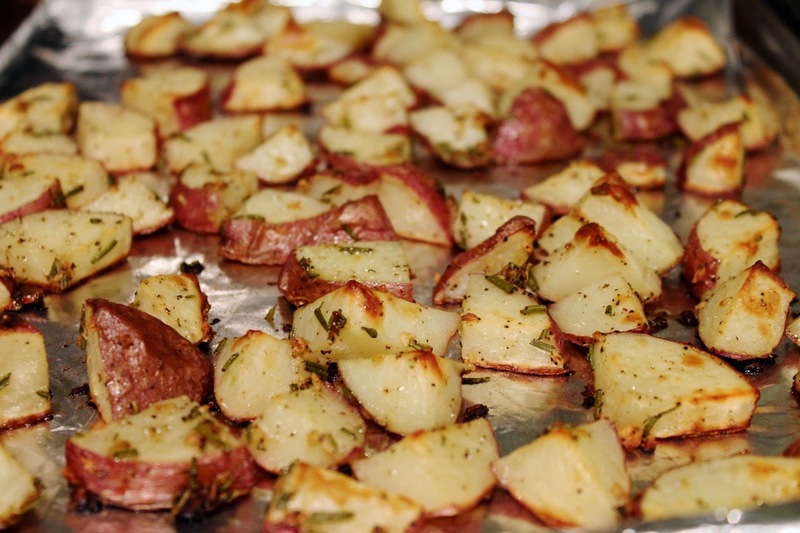 Spread potatoes in an even layer on a baking sheet and roast until lightly browned around the edges, about 30-40 minutes. Sprinkle with pepper and serve. One of the interesting aspects of learning about classic cocktails is the discovery that their recipes are not necessarily as "set in stone" as some would like you believe. Cocktail mavens often have very strong opinions about how classic drinks should be made, but their views are often just that: opinions. For every authority who insists a drink be made a certain way, I can find a similarly respected authority who does it differently. Take the Martinez. 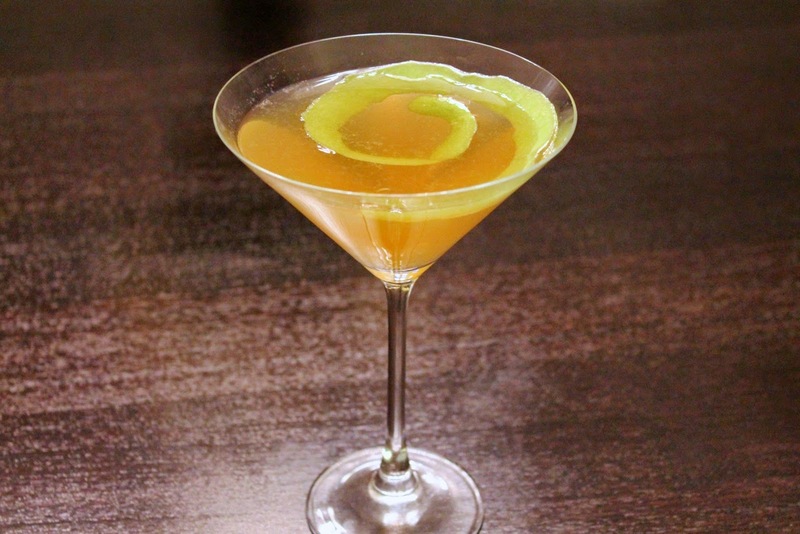 This is a classic 19th century cocktail, a forerunner of the modern-day dry gin martini. It's made with gin, technically old tom gin, sweet vermouth, maraschino liqueur and bitters. Sounds pretty solid. 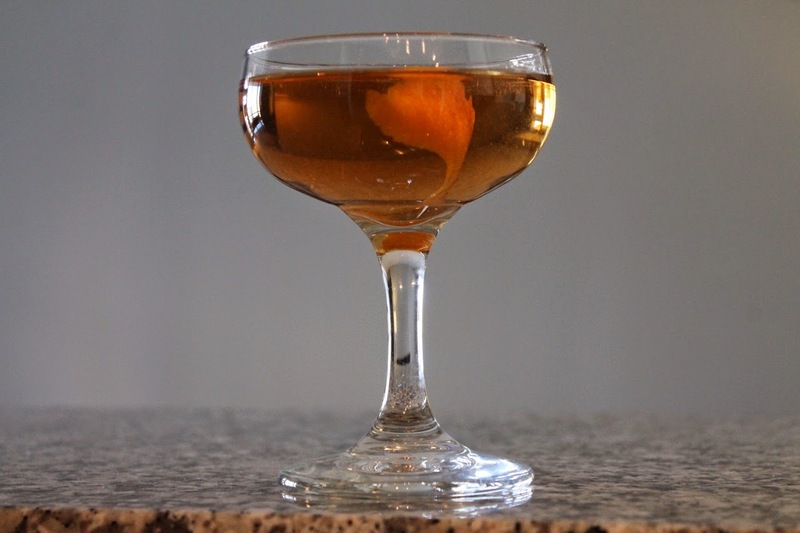 But in researching this drink, I found significant variation in the gin-to-vermouth ratio, the other ingredients, the garnish and even the mixing technique among three venerable cocktail recipe sources. The ratio of gin-to-vermouth, an oft debated subject for the modern dry gin martini, is a key variable here. In Imbibe!, David Wondrich reproduces Jerry Thomas's 19th century recipe with a 1:2 gin:vermouth ratio; in The PDT Cocktail Book, Jim Meehan shares a 1:1 equal parts recipe; and in Death & Co, the New York cocktail bar favors 2:1, so twice as much gin. When it comes to the ratio, I'm going to side with Death & Co. Because I made the drink with Hayman's old tom gin--which is already sweetened--as well as maraschino liqueur, I don't think it needs the sweetness of more sweet vermouth. However, if you made this with Ransom old tom gin, which isn't sweetened, you might want to try the 1:1. But Death & Co includes a more complicated recipe that includes both Hayman's and Ransom old tom gins, plus kirsch and homemade orange bitters, and I wanted something simpler. For the sake of tradition, I was hoping to like Wondrich's recipe, but it calls for shaking the drink, and given the ingredients, I really think it should be stirred. In the end, I settled for the PDT recipe but with Death & Co's gin-to-vermouth ratio. Combine gin, sweet vermouth, maraschino liqueur and bitters in a cocktail mixing glass. Add ice and stir until very cold. Strain into a chilled coupe glass. Garnish with orange peel. Sunday, when the forecast called for "wintry mix," we decided to go out for lunch. By the time we returned home--coated in a cold sheet of wet ice--we were really for a warm stiff one. So I concocted this winter warmer to thaw us out. And today we're in the middle of ANOTHER winter storm. I know we D.C.ers have no right to complain when you compare our winter weather to the bitter windy cold of Chicago or the much heftier snowfalls of the Northeast. Yet, this winter has been our most trying since "Snowmageddon." I'm really ready for spring and I know I'm not alone. So here's a warm winter cocktail to help make today a little easier. It's flavored with tea and honey and gets a little smoke from Laphroaig Scotch, currently my favorite way to make a cocktail a little smoky (well, that and a good mezcal). 1. 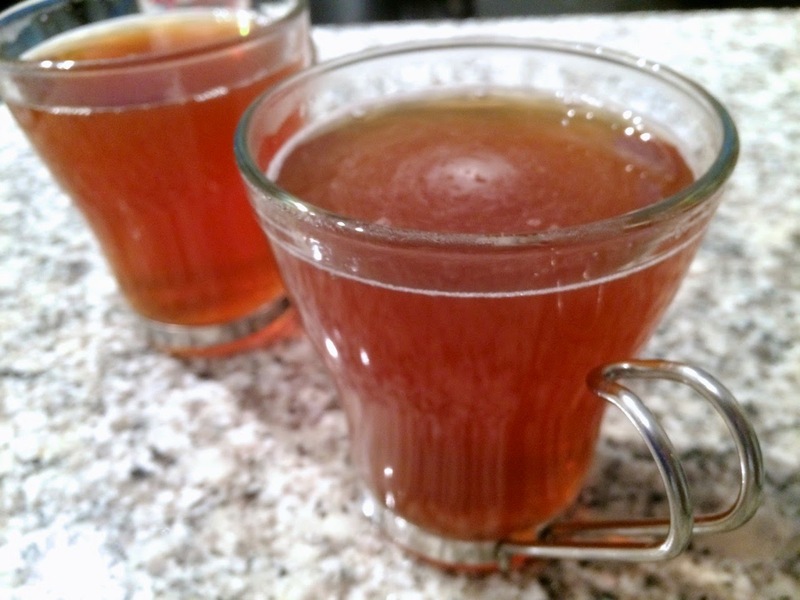 Combine the water and honey in a microwave-safe glass (like a 1-cup Pyrex glass measuring cup). Microwave on high 2-3 minutes until boiling. Add the teabag and steep for 4 minutes. Remove the tea bag and stir to combine. 2. Set out two glasses (you can use ceramic or tempered glass mugs). Combine 2 dashes bitters, 1 oz. Laphroaig Scotch and 1 oz. bourbon in each glass. Add half the hot tea mixture to each glass and stir to combine. Serve warm. There are there those things no kitchen should be without: knives and cutting boards, pots and pans, measuring cups and spoons, mixing bowls, whisks and spatulas. If you were outfitting your kitchen for the first time, that's the list you would want to shop from. And if you were a minimalist, you could cook just about anything from that list. But I'm not a minimalist, well, not exactly. I live in an apartment, so I don't have a particularly large kitchen. I generally subscribe to the idea that if I'm going to get a new kitchen gadget, it needs to be versatile. I don't have the space to store a lot of extras. Small appliances in particular are bought with care. I don't have a bread-maker or rice-cooker not because I don't think they'd be great, but I just don't have room. That said, I do have a few more specialized pieces of equipment that I just love to pieces. Admittedly, these are "nonessentials," yet, given how much I use them, I would hardly consider them extraneous. They're the nonessentials I can't live without. At first blush, this one might seem like the biggest gimmick of the pack. It does only one thing: minces garlic. It's the kind of thing that might be advertised in an informercial. Yet, I bet many of you have a device you use only for this purpose: a garlic press. And the garlic twist works so much better than a garlic press that I actually got rid of my press years ago. A garlic press always leaves about 1/4 of the clove behind has a large mashed chunk. The garlic twist minces the entire clove. No waste. Plus, you can control the size of the mince: twist just a few times for chunkier mince, add salt and twist many times for garlic paste. My version is one of the earliest ones; newer models feature a more ergonomic grip. This tool could be considered nonessential because it does the same thing another appliance you probably have in your kitchen can do: a blender. 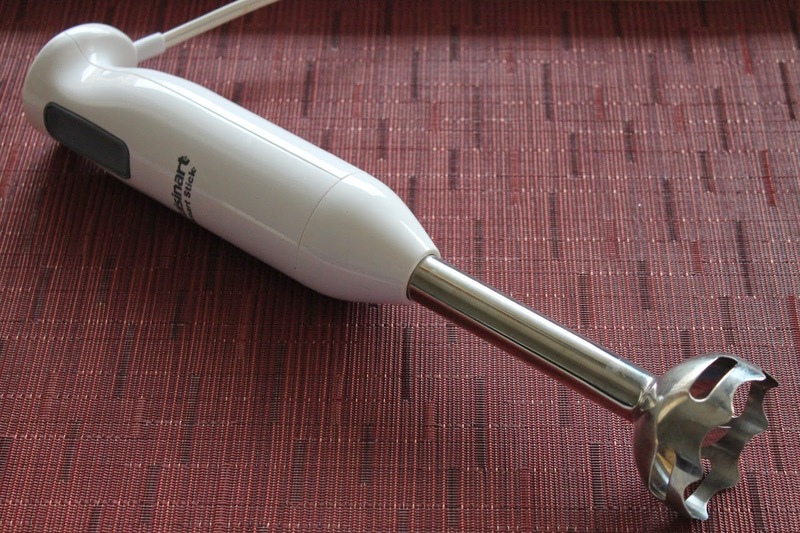 But there are a lot of reasons for why having an immersion blender is such a great idea. 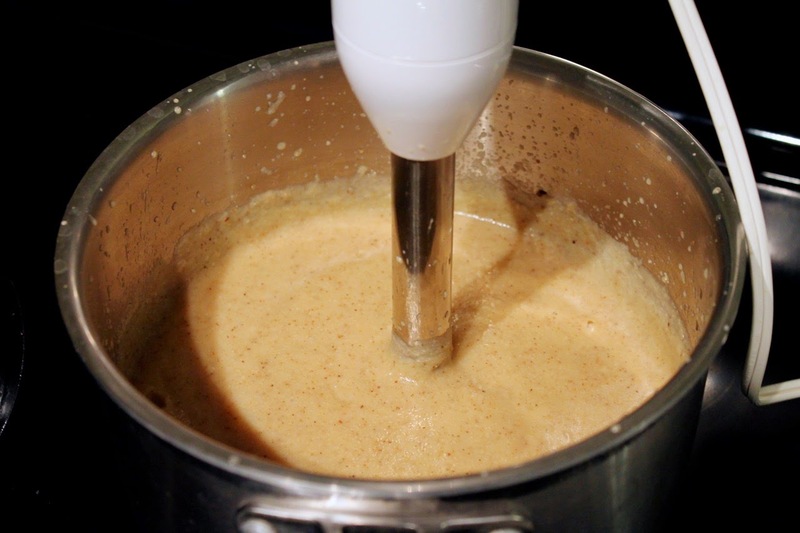 While a traditional blender is probably better for drinks, immersion blenders are wonderful tools for making purees and sauces, especially soups. Ever make a recipe for a pureed soup using a blender? It generally instructs you to transfer the soup "in batches" to a blender. This means finding (and dirtying) some sort of vessel for transporting the soup between the soup pot and the blender. Plus you need another contain to store the "batches" that have been pureed, since you can't put them back into the pot with the as-yet-to-be-pureed chunks. In short, it's a recipe for a big mess. With an immersion blender, you just stick the thing in the soup pot and press the "on" button to puree. It cleans up easily. I love it. It's perfect for soups like Sweet Potato and Soup or making sauces like mole sauce for Mole Chicken Enchiladas. 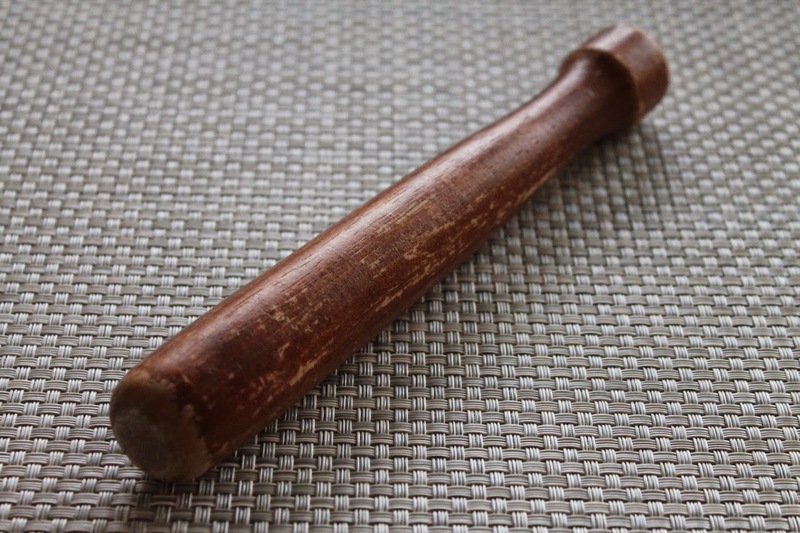 Sure, a muddler is designed for crushing herbs and fruit in cocktails, but the rounded end is also perfect for grinding. 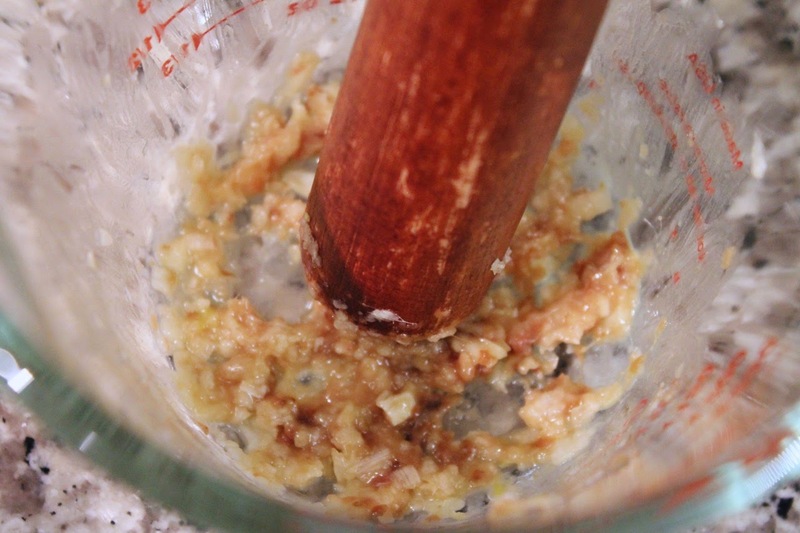 Lacking a proper mortar and pestle, I use a Pyrex glass measuring cup and a muddler for doing things like grinding garlic and anchovies into paste for dressing for Heirloom Tomato Panzanella or Caesar Salad. Sure you can use your hands to squeeze citrus fruit. But when you're making cocktails that call for a lot fruit, like margaritas, a citrus press saves not only time but your hands as well. It's more efficient and more effective. 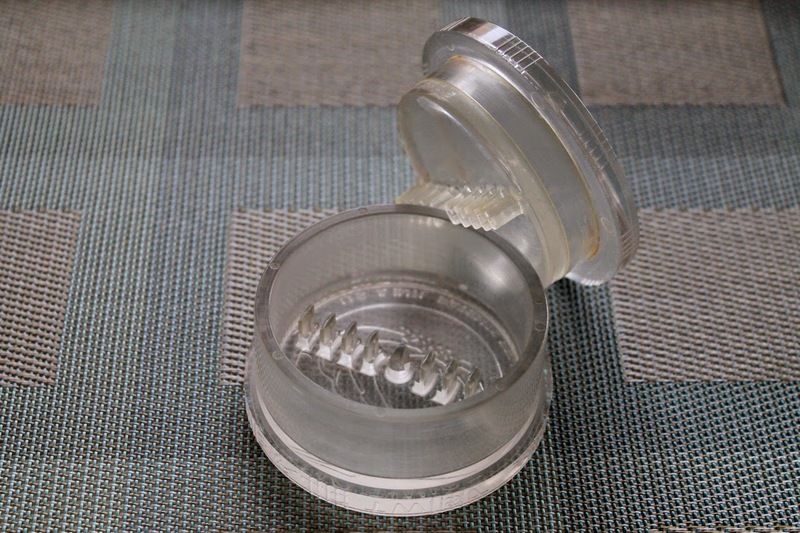 Seeds are usually too big to pass through the holes and a well designed press will keep the juice from squirting in your eye. At first blush, an oval sauté pan may seem impractical. It's too large to fit over a burner, creating the potential for uneven heat. This, however, can be an advantage in certain dishes. When making chili, for example, I set one end over the burner, brown the meat in that end, then push it to the "cool" end while I brown the vegetables in the hot end. The large size is also ideal for making pasta sauce, especially if finishing the noodles in the sauce. I almost always prefer using it to my 12-inch frying pans. 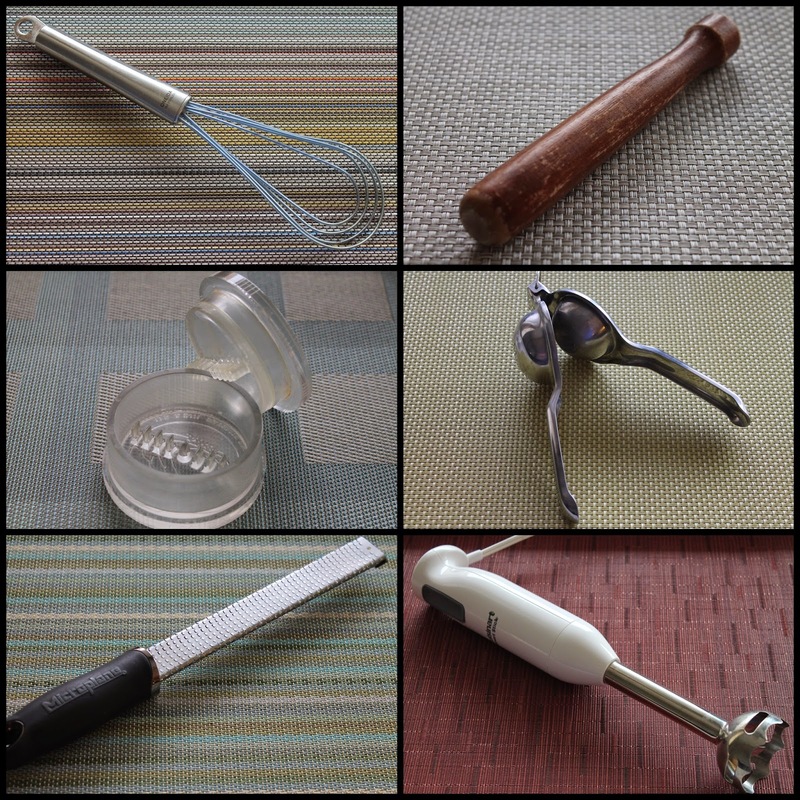 A standard whisk is very useful for beating eggs and mixing certain batters. But when you're making gravy, a flat whisk works much better. 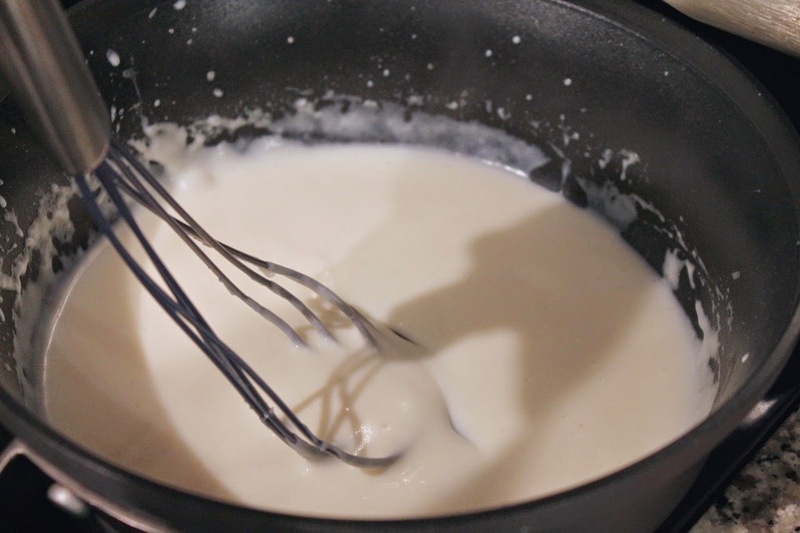 It's also useful for smoothing sauces like béchamel for Macaroni & Cheese. The microplane is a rather cool tool, as it looks like something you'd have in a woodworking shop, yet it's practicality in the kitchen cannot be understated. 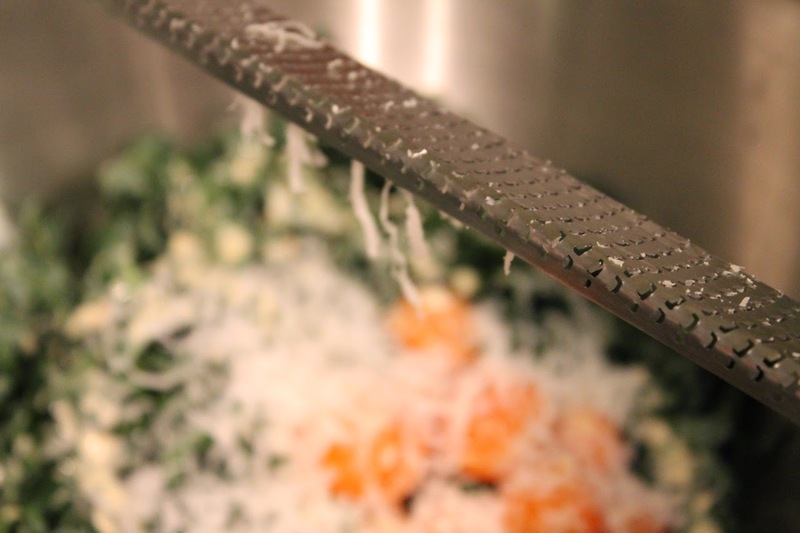 It's much more effective than a box grater for fine-grating foods like parmesan, lemon zest and nutmeg.